Everyone has a favourite way to enjoy their free time or relax after a stressful day. So to find out how Australians incorporate leisure activities into their daily lives, we conducted an online poll study of 200 people via our proprietary research panel – “LiveTribe”. The sample was drawn representatively based on the national distributions for gender, age and location in Australia as stipulated by the Australian Bureau of Statistics (ABS). The majority of Australians (92%) chose to spend their free time engaged in entertainment activities, with watching TV, a video or DVD topping this category at 85%. 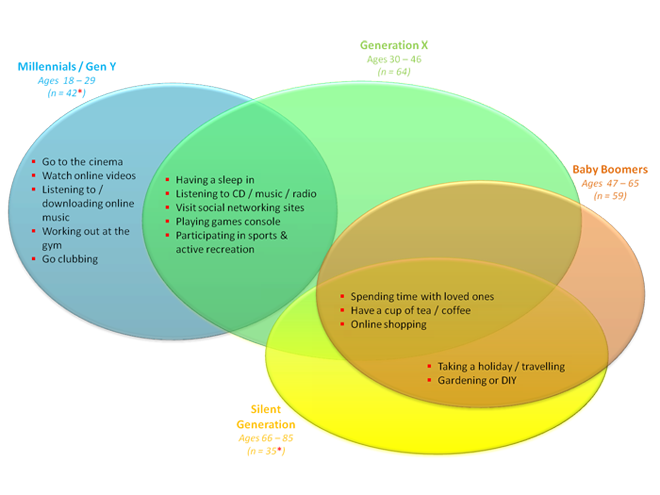 Personal time was considered nearly as important (90%), with “reading” (63%) considered the best way to spend time alone, followed then by “listening to music” and “enjoying a sleep in” both getting scores of 51%. Almost 9 out of 10 Australians listed food indulgence as a way of unwinding themselves. Australians appeared to strongly value spending time with family (74%), while 52% liked to chat or hang out with their friends. With a 78.3% internet penetration rate (source : Internet World Stat, March 2011), it is not surprising that 2 out of 3 Australians cited “web surfing” as a preferred way to spend their free time. Taking a holiday (60%) was considered a favourite way for Australians to reward themselves. Not surprisingly Australians considered a traditional Aussie BBQ (51%) as the best way to socialise with their friends and family. Our findings revealed that there was a significant difference between males and females in regards to how they spend their free time. Males tend to spend more time surfing the internet (76%),compared to females who scored this pastime at 56%. 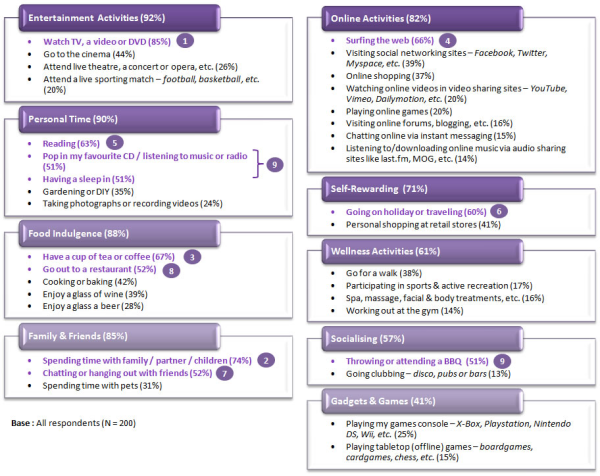 In contrast, spending time with loved ones (85%) was the most common leisure activity cited among females. Furthermore, food was considered the indulgent pleasure of females, with nearly three-quarters of them preferring to relax over a cup of tea or coffee, and more than half (54%) choosing to cook or bake during their free time. “Gen Y's” or “Millennials” prefer to spend time with friends over family, this due to spending more of their free time on out-of-home activities. Younger generations (Gen X & Y) keep themselves occupied with a string of active lifestyle pursuits while placing also a high value on balancing these activities with adequate sleep. Serenity mattered the most to older generations, these being the “Baby Boomers” and the “Silent Generation”. When it comes to leisure time, they were more likely to opt for holiday retreats, gardening and DIY pursuits. Time spent on various online activities were high (82%) as internet has progressed in becoming an integral part of daily life for many Australians. 64% of Australian internet users surf the web several times daily. Social networking (SN) is now a truly global phenomenon. 39% of Australians engage in social networking as a leisure pursuit, with half of these being heavy users who frequent a SN site several times a day. 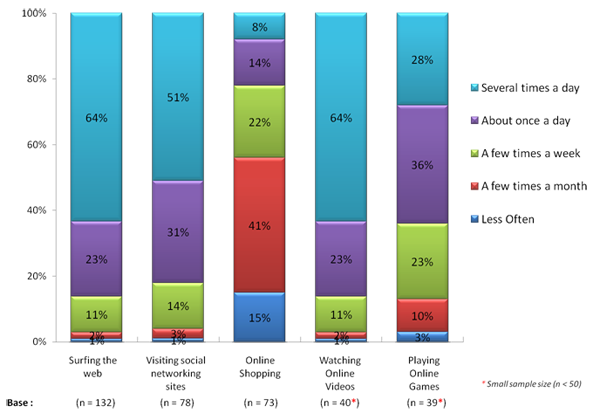 Close to one-quarter (20%) were either watching online videos via video sharing sites and/or gaming online. 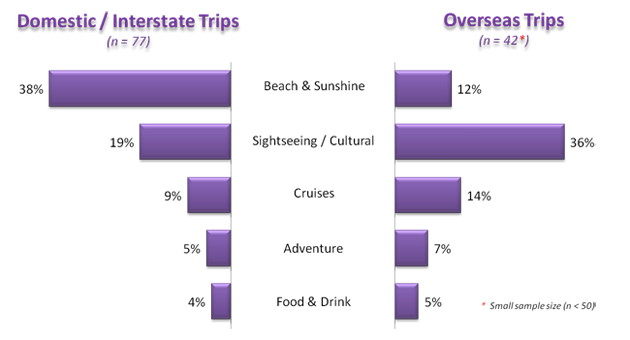 Taking a holiday or traveling (60%) was another favourite way to relax among the Australian participants we polled, of whom 65% preferred interstate / domestic trips. With spellbinding coastline and iconic beach destinations dotted across Australia, it is not surprising that 2 in 5 domestic travellers favoured a ‘beach and sunshine’ holiday to unwind. ‘Sightseeing and cultural trip’ (36%) was considered by Australians as the best way to experience an overseas destination. Getting to know more about the everyday life of your target audience is being able to demonstrate that you understand what drives their daily decision making habits. Keeping abreast of the shifting trends towards leisure activities helps you to profile and capture your core consumer market more effectively, convey your intended message across and uncover any fundamentally shifts in their mindset.